is the largest integer that is a factor of two or more integers. The acronym GCF is often used. In order to find the GCF you must first find the prime factors of the integers, and then compare what they have in common and take their largest factor. the GCF between 8, 12 and 24 is....do you know? The Greatest Common Factor is a concept easier to understand than its name is to remember, yet not so easy to digest immediately, really. Like for the whole of mathematics and algebra, You must exercise it! It is of paramount importance in algebra. 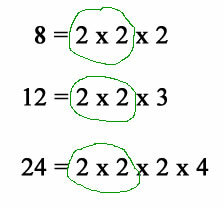 It helps simplify fractions. 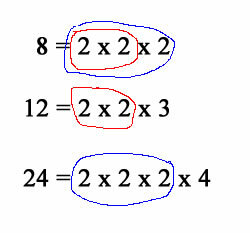 It goes together with the Least Common Multiple (LCM). only by intuition, the remote consequences only by deduction. of D. [Torrey] (New York, 1892), pp. 64, 65.
tant discoveries to this fruitful means, which is called induction. the principle of universal gravity. LAPLACE. scott and Emory] (New York 1902), p. 176.
nature, and the consequent extreme generality of its language. System of Logic, Bk. 2, chap. 6, 2.